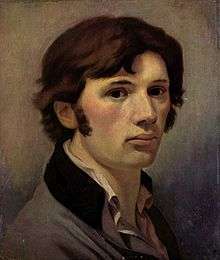 Philipp Otto Runge (German: [ˈʀʊŋə]; 23 July 1777 – 2 December 1810) was a Romantic German painter and draughtsman. He made a late start to his career and died young, nonetheless he is considered among the best German Romantic painters. Runge's interest in color was the natural result of his work as a painter and of having an enquiring mind. Among his accepted tenets was that "as is known, there are only three colors, yellow, red, and blue" (letter to Goethe of July 3, 1806). His goal was to establish the complete world of colors resulting from mixture of the three, among themselves and together with white and black. In the same lengthy letter, Runge discussed in some detail his views on color order and included a sketch of a mixture circle, with the three primary colors forming an equilateral triangle and, together with their pair-wise mixtures, a hexagon. He arrived at the concept of the color sphere sometime in 1807, as indicated in his letter to Goethe of November 21 of that year, by expanding the hue circle into a sphere, with white and black forming the two opposing poles. A color mixture solid of a double-triangular pyramid had been proposed by Tobias Mayer in 1758, a fact known to Runge. His expansion of that solid into a sphere appears to have had an idealistic basis rather than one of logical necessity. With his disk color mixture experiments of 1807, he hoped to provide scientific support for the sphere form. 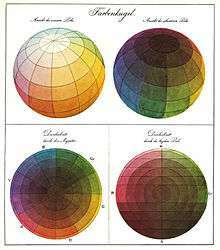 Encouraged by Goethe and other friends, he wrote in 1808 a manuscript describing the color sphere, published in Hamburg early in 1810. In addition to a description of the color sphere, it contains an illustrated essay on rules of color harmony and one on color in nature written by Runge's friend Henrik Steffens. An included hand-colored plate shows two different views of the surface of the sphere as well as horizontal and vertical slices showing the organization of its interior (see figure on left). Runge's premature death limited the impact of this work. Goethe, who had read the manuscript before publication, mentioned it in his Farbenlehre of 1810 as "successfully concluding this kind of effort." It was soon overshadowed by Michel Eugène Chevreul's hemispherical system of 1839. A spherical color order system was patented in 1900 by Albert Henry Munsell, soon replaced with an irregular form of the solid. ↑ Maltzahn, H. 1940, Philipp Otto Runge's Briefwechsel mit Goethe, Weimar: Verlag der Goethe-Gesellschaft. 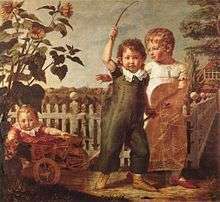 Wikimedia Commons has media related to Philipp Otto Runge. "Works by Philipp Otto Runge". Zeno.org (in German).